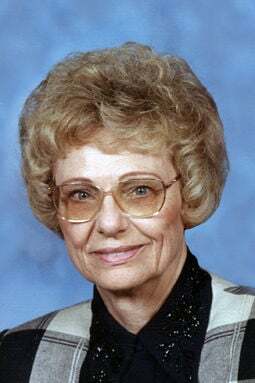 Betty A. McCabe, age 80, passed away Friday, Feb. 1, 2019, at Nye Legacy Nursing Home. Betty A. McCabe was born at home in Scribner on Jan. 16, 1939, to Reinhold and Eleonore (Toelle) Wegner. She graduated from Scribner High School in 1956. She worked at the Farmers Co-op from 1956 to 1959, then moved on to the Fremont Tribune to answer phones for one year. She worked at the Mead Conveyor Missile Base from 1960 to 1962. She married Douglas McCabe on April 5, 1959. Betty started working for Blacktop, Inc. in Fremont who was bought out by Peter Kiewit & Sons. She started driving back and forth to Kiewit in Omaha in 1973 and retired in April of 2002 after 29 years. She was involved in the Beta Upsilon chapter of Upsilon Sigma Alpha since 1960 and loved spending time at conventions and dinners/parties with her sorority friends and spouses. She also loved working in her yard and tending to all her plants and flowers. She helped out Douglas with his lawn mowing business for many years but always had time to spoil her granddaughter. Betty and Douglas had one daughter, Andrea (David) Millet, and one granddaughter, Madison, and actually enjoyed two granddogs. She was preceded in death by her father, mother, sister and brother. Memorials have been established to Trinity Lutheran Church. Memorial services will be held at 10:30 a.m. on Wednesday, Feb. 6, at Dugan Funeral Chapel. Private burial.